The strongest empire the world had ever seen. 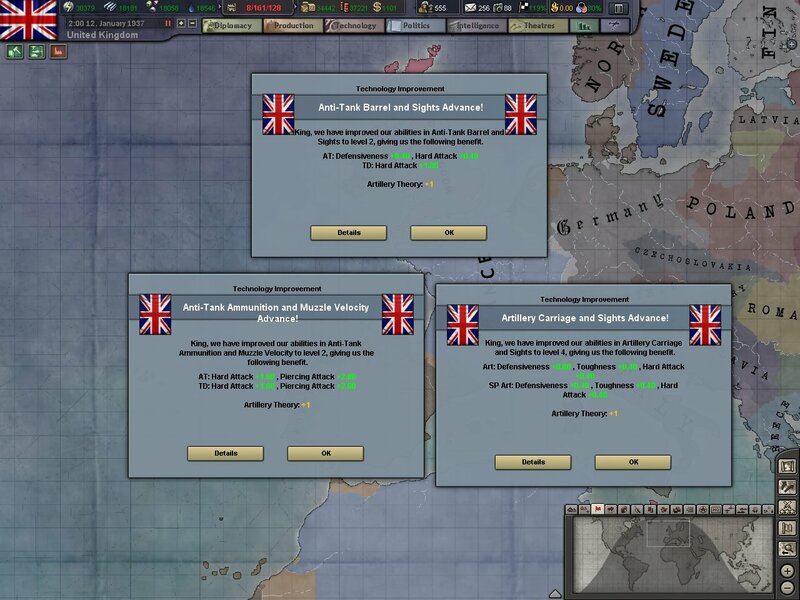 Just twenty years after surviving the horrors of the First World War and defeating Germany, the Empire was stronger than ever. Reaching from London to Hong Kong and with a dozens of stations in between. Our reach was unparalleled. We were stronger than ever, but stretched almost to our breaking point. Many of our overseas deployments are much like we the troops we have deployed in Malta. Men who are trained yes, but not properly equipped, ill supported and with insufficient man power to defend their vital posts. The navy is very much the same. Prime capital ships are spread across the globe ill-supported and not deployed according to the military's needs. The RAF is the one branch that isn't stretched thin, mainly because the air force lacks the strength to be stretched thin. If the British Empire is to retain it's position as the worlds super power, then a major overhaul of the whole military is going to be needed. We took our proposals to parliament. We requested brand new military installations in several key points. Gibraltar, Malta, Singapore, Hong Kong. As well as upgrades to existing military bases abroad and at home. We requested a modernization of the navy, with a focus on aircraft carriers supported by the big gun battleships. The lords and honorable members of parliament laughed us down at that one. Injecting the air force with new and more modern planes was also seen as ridiculous. 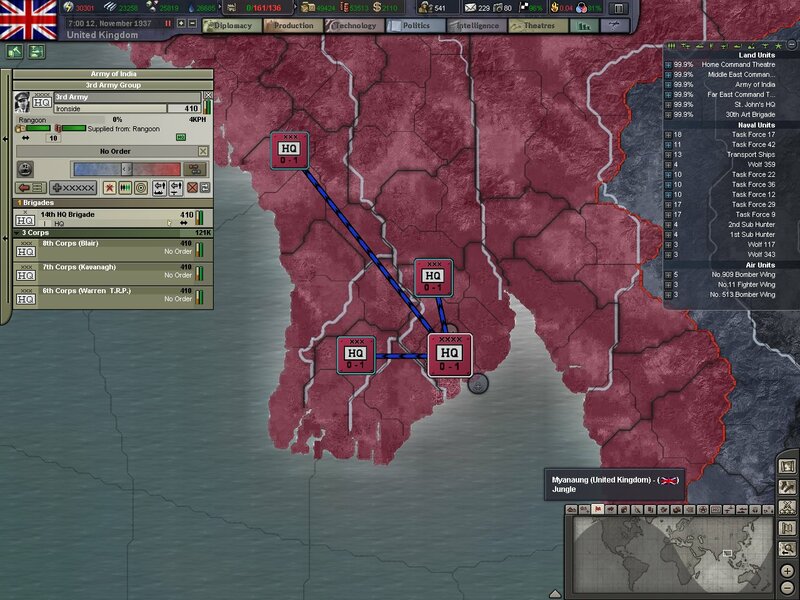 In the end, we had to settle for an expansion of military installations as well as the upgrades we requested, and for an overhaul of the army. The Royal Navy and Air Force would have to wait till the budget could accommodate it. But what good is a man with a nice shiny rifle if we haven't the means to get him from his training in Sandhurst to his deployment overseas? I know you'll give me an answer but the lords in parliament just laughed at me. And only a few weeks after our meetings with parliament, Adolf Hitler made his first bold move on the world stage. Sure he's increased the military way over the 100,000 limit Germany was given after the Versailles Treaty. But we let him get away with that. 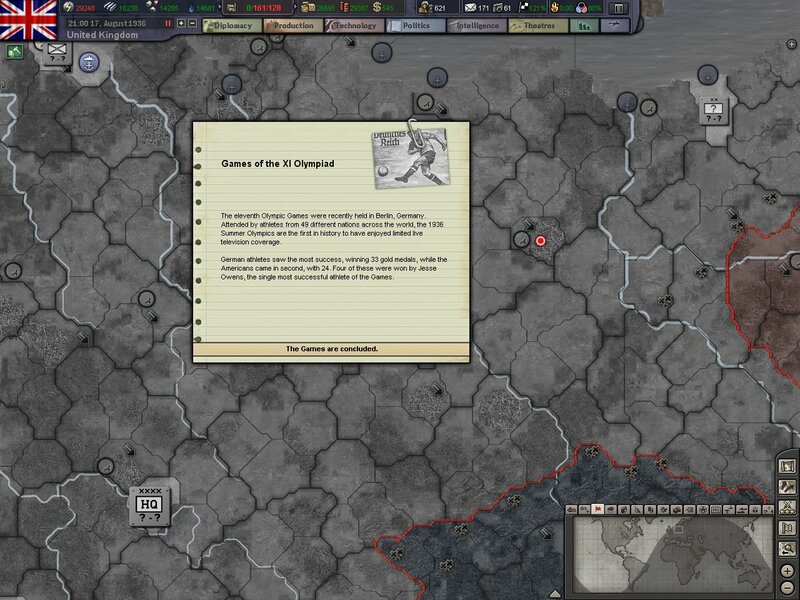 Now he's marched troops into the Rhineland, broken another part of the treaty, but this time it was a fairly major one. 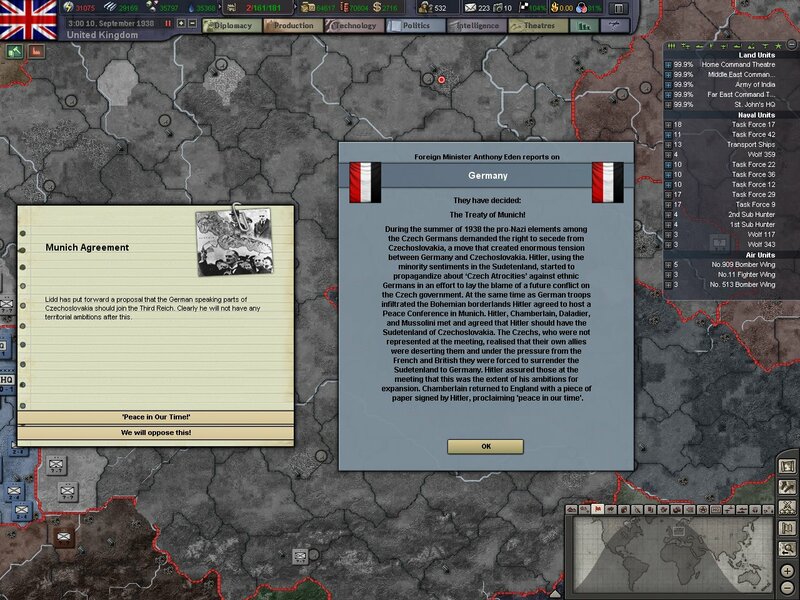 Talks began immediately with the French government and the subject of intervention came up but neither governments were willing to commit to another war. And besides said the lords of Parliament, the Rhineland was technically German land whats wrong with German troops in German land? 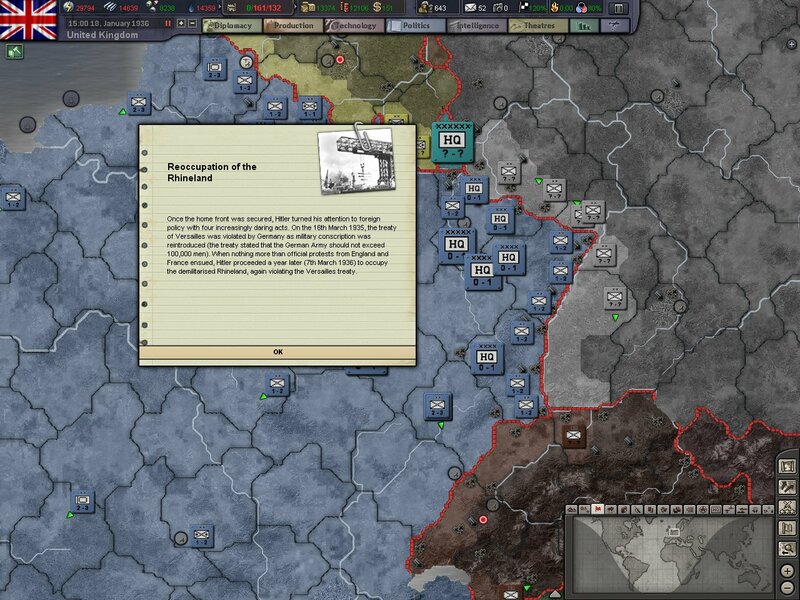 With the plans laid out for military expansion the year of 1936 was going to be a big one. Inspections of all military installations and outposts were ordered and commenced. Anywhere we could find fat to trim off we did, anywhere we could find to improve something we did. Majority of our forces overseas and at home were lacking in heavy equipment,mainly artillery. Over 25 artillery brigades were ordered for our troops at Home, India, and Egypt. With the planned expansions to our ground forces we had to figure out what changes we could make to our navy and airforce. Both branches of the military were ordered home and then reorganized into new task forces. Our big gunned capital ships and aircraft carriers were split into task forces, as well as our submarines were made into wolf packs. Any spare ships we had left over were made into flotillas that would be used primarily for hunting enemy submarines. With the new dispositions of the navy, we put it all to the test. A series of war games were ordered across all branches. 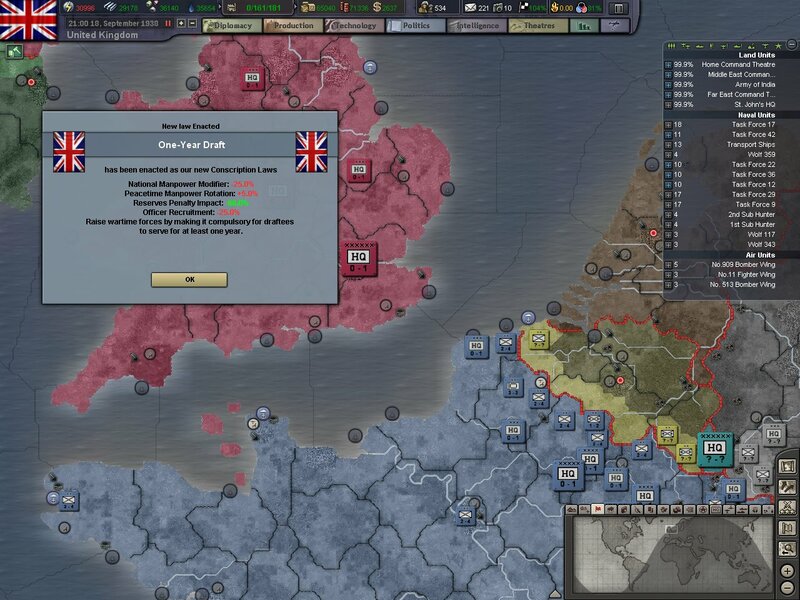 We ordered the navy into the North Sea where they would spend several weeks going over drills and routines, as well as mock attacks involving all aspects of our fleet. 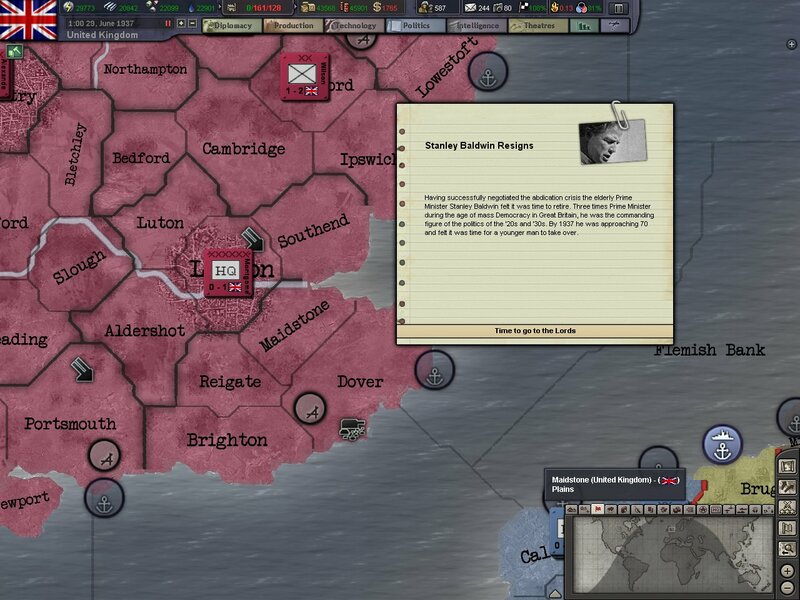 The Home Army and Royal Air Force would do their own war games. Any officers or NCO's that couldn't deal with the stress of these drills and games were kicked out immediately; as they surely wouldn't be able to hack it in actual warfare. We also made changes to the military staff. Out with some old faces and in with some faces and new ideas. We needed the military to become leaner, meaner, and above all. Smarter. We received shocking news in March. Italy, which was rapidly becoming fascist. Had completed its brutal invasion and occupation of Ethiopia. 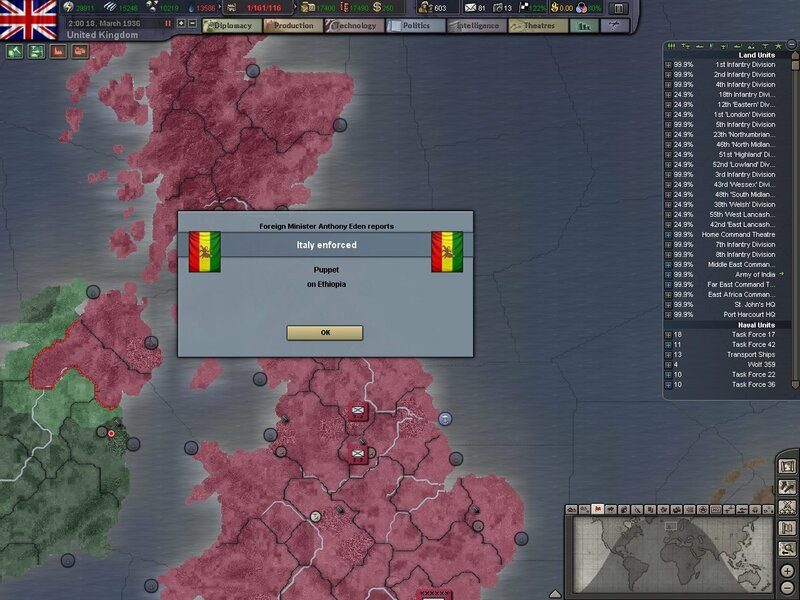 Reports of the Italians using gas against the Ethiopians who didn't possess mechanized vehicles was simply barbaric and was condemned as an illegal invasion by British parliament. May began with good and bad news. The good news is that we completed new industrial technology which gave us some more desperately needed IC. The bad news is that Parliament and the Royal Family was rocked by a scandal. Edward VIII wanted to marry a divorced Catholic, the nerve. So instead of forcing the scandal and horror he abdicated to his brother George VI. 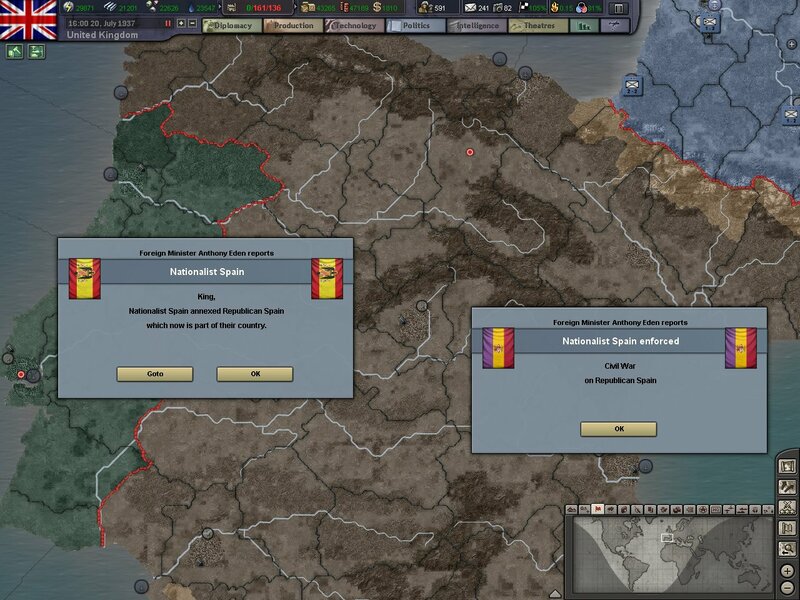 Spain is also breaking out into a brutal civil war. A volunteer brigade was soon formed and roughly 2,000 brave men departed to Spain. We also sent military advisers and what equipment we had no need of anymore. In mid-May we turned our sites on another aspect of war we have to improve. MI5 and MI6 had had little to due in the last twenty years. Now with new fascist governments rising up in Italy and Germany they have a new task for themselves. We sent spies into Germany and the reports we've gotten back are disturbing. 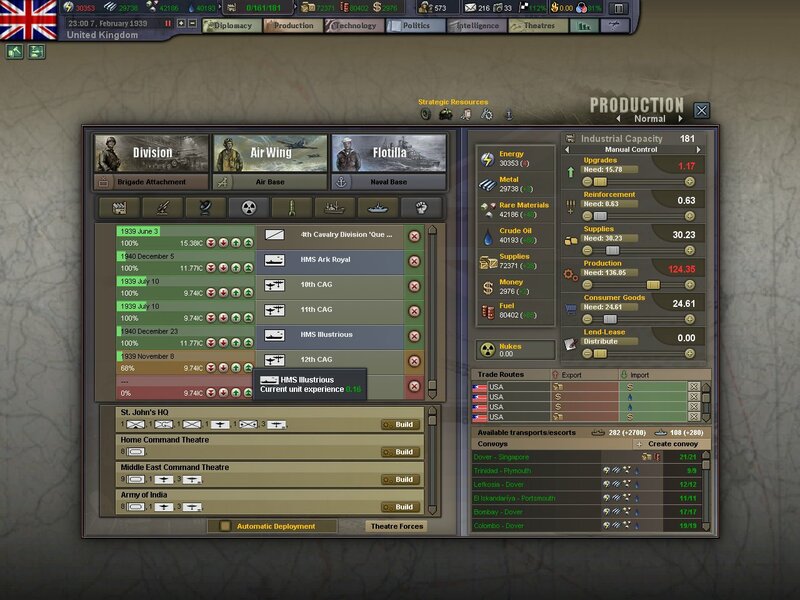 New infantry divisions, a new SS one as well. And the reports that the Luftwaffe is expanding its fleet are also beginning to filter back. But the report that caught my eye, and several eyes in the chiefs of staff. Was the report of a rocket test site being built in Koblenz. Which is just close enough to the French and Belgian borders that rockets launched from that site could be a potential danger to military targets, as well as major cities and civilians. While our spies infiltrated Germany and it's allies, our athletes entered as well. All of Germany had been white-washed clean of any anti-Jewish sentiment for the games and it was made to appear beautiful and clean. Our information agencies saw through the ruse but much of the world didn't. The games weren't anything special for our Empire. Our athletes won 14 medals in total, four of them being gold. The rest of 1936 passed without much incident. All the war games were finished up and the lessons learnt from them were taken into consideration among all branches. Most of the artillery and heavy equipment was also delivered to army units by the end of the year. When the new year began our anti-tank as well as our artillery were improved. Both would be crucial to our armies in the event of war. Several months later a huge batch of technology was researched. Our naval ships were quickly becoming more modern and soon our fleet would be the most modern and back to it's place that it was before the Great War. In June, Prime Minister Stanley Baldwin decided that his long and storied political career had finally reached its end. 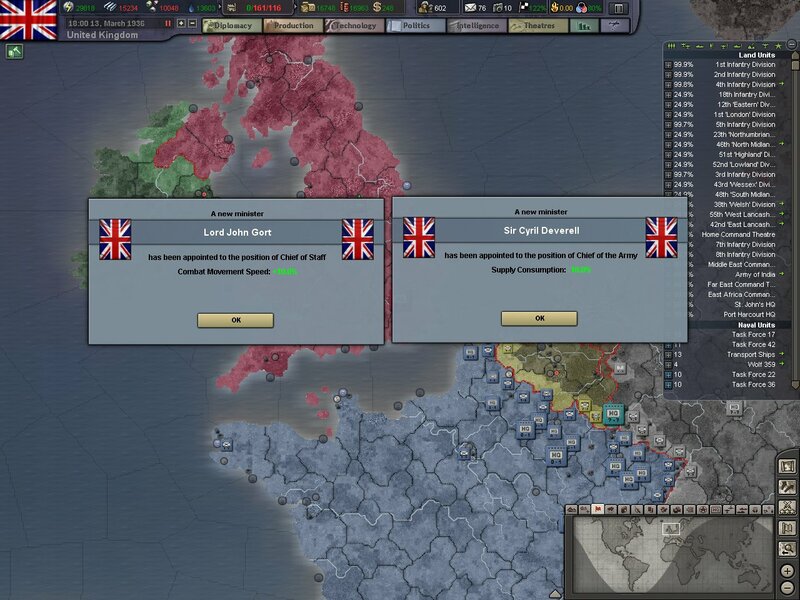 The man who had led the Empire through the great depression and who helped rebuild it after the Great War; finally decided to call it quits. Upon Baldwin's resignation, he was knighted by King George VI and was made an Earl. Neville Chamberlain succeeded him as Prime Minister. General elections were considered but with three years left before the next one, Prime Minister Chamberlain considered the country would survive. 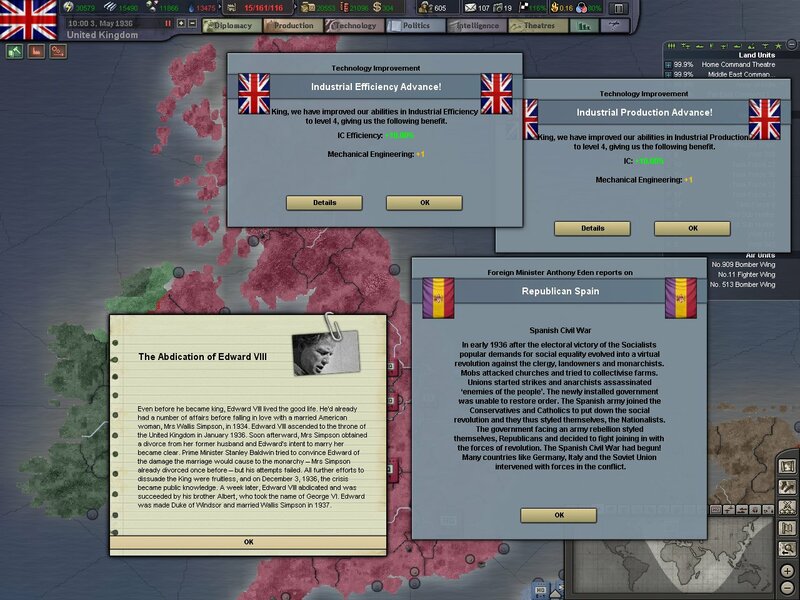 Just over a month after a changing of the guard in Parliament, the brutal and bloody civil war in Spain came to an end. For several months it looked like the Republicans had the Nationalists on the ropes. But alas it was not to be and the Nationalist won. An estimated 2,500 British citizens volunteered and went over. When the war was over, British volunteers were disbanded and when 800 of them arrived at Plymouth, a huge crowd was there to welcome them with warm food and beer. 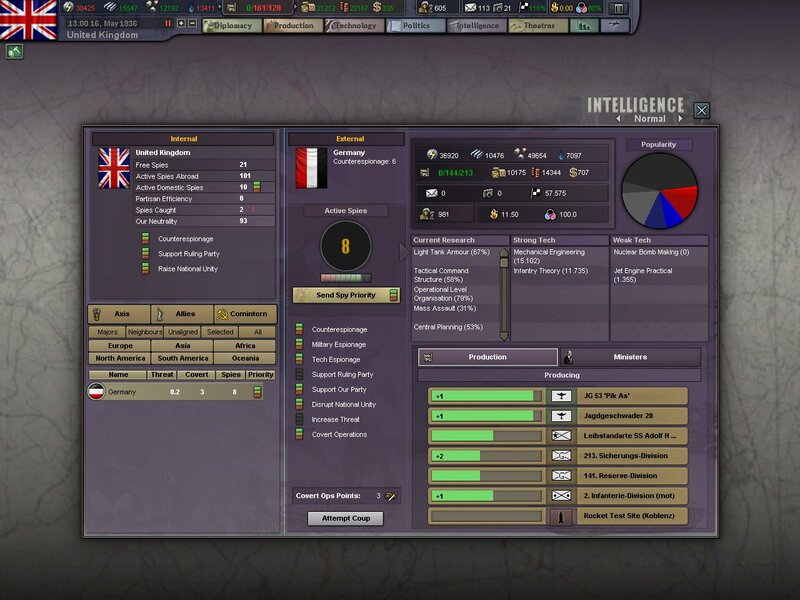 While the war in Spain occupied most of the world's eyes, the British army was being upgraded. The Home Army's divisions and corps were reinforced to bring them up to full strength. Our Indian army was fully reinforced to have 2 full corps and 1 half corp. All divisions had 3 infantry brigades and one artillery. Divisions to reinforce our over seas deployments in-Hong Kong,Gibraltar, Malta, and Cyprus were ordered. 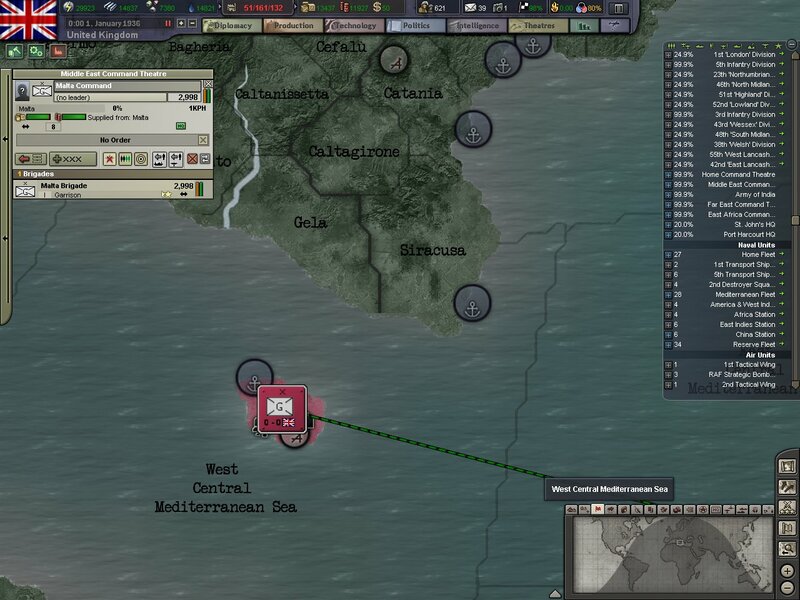 Divisions were also ordered for a corp in Egypt and another to defend Singapore. 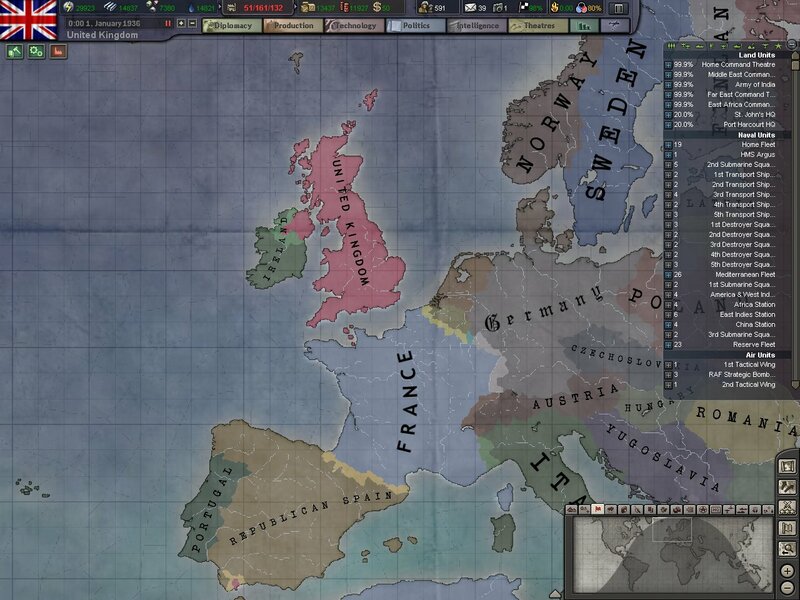 As the Empire got ready for Christmas and New Year celebrations around the world, Japan joined in league with Nazi Germany. 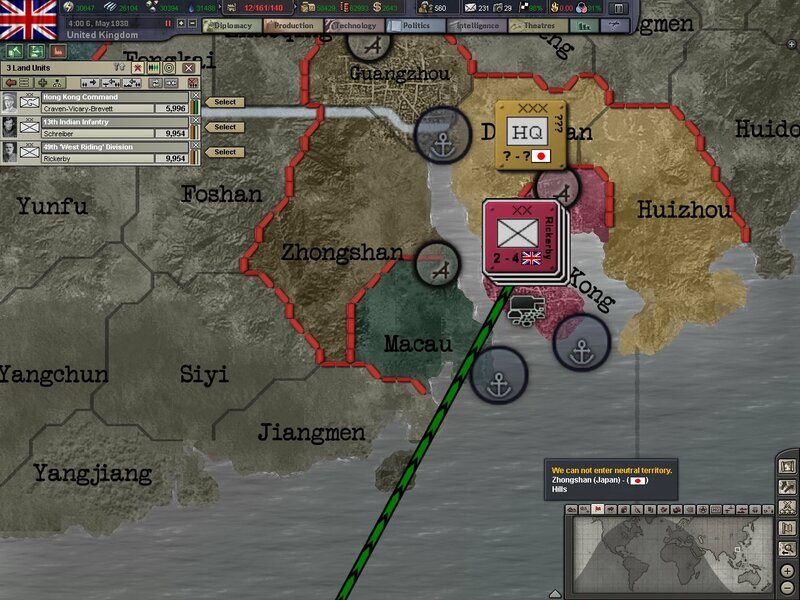 Japan joining the Axis was not something we had anticipated, and it meant that any war with Germany would also have to be fought in the Far East against Japan. 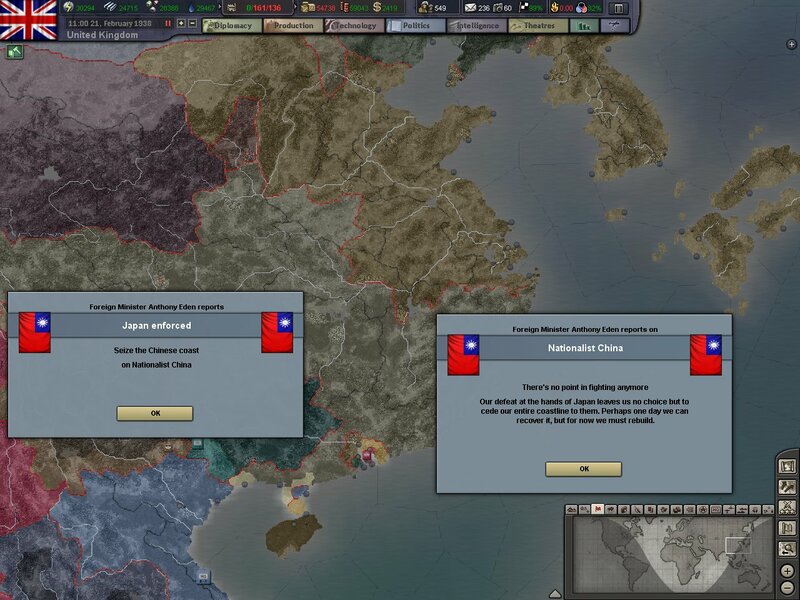 In the new year of 1938 Japan finally brought it's war against China to an end. 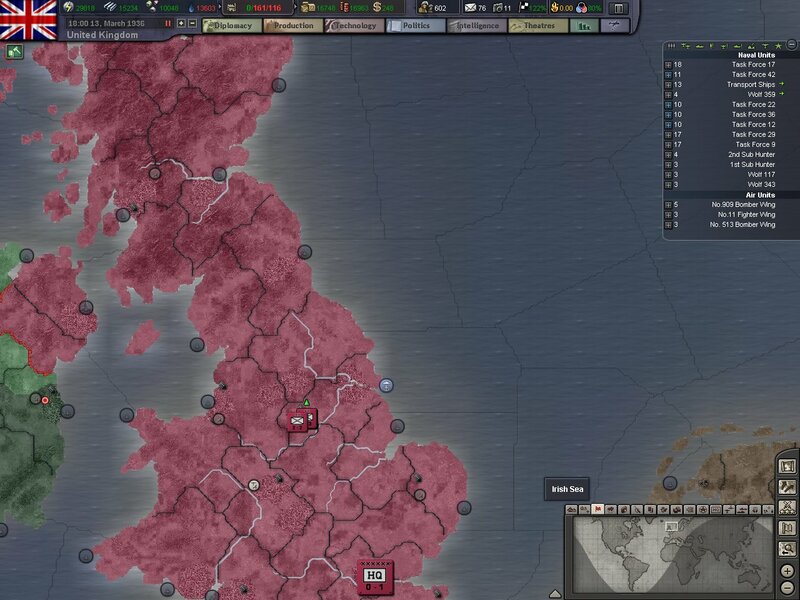 The aggressive expansion of Japan brought many worrying eyes from the British cabinet and war ministry. Most concerning was the new land Japan had gained around Hong Kong. That new territory would make a land assault against Hong Kong possible and put the garrison there in a more precarious position. In march, the world was shocked. 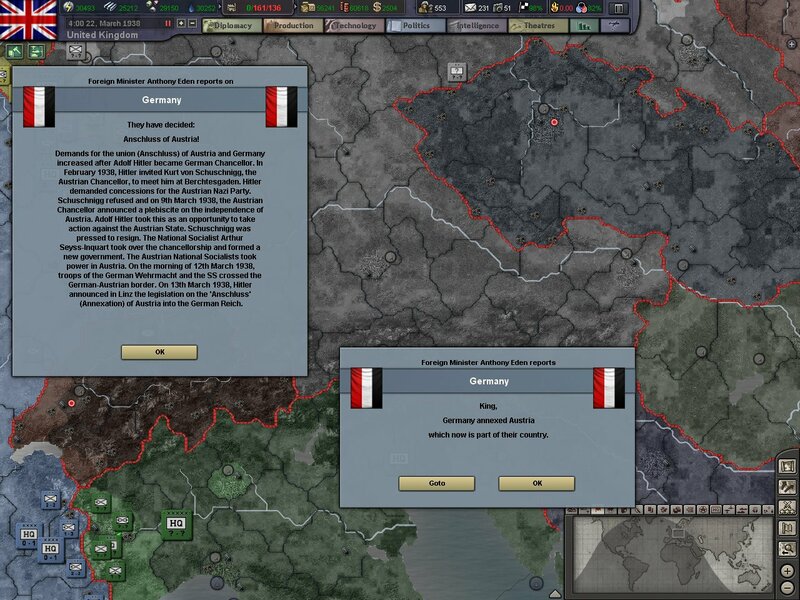 Hitler, and his Nazi Germany had annexed a neutral country. Yes the news reels showed us cheering crowds and a population that was happy, almost grateful to see Nazi Germany takeover. 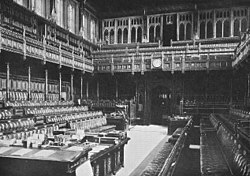 Our cabinet and ministry had seen the rioting done by the Austrian Nazi Party, and the threatened invasion that Hitler had made. Austria was put into a bad position, and they made a pact with evil. In the beginning of May we finally finished bolstering our overseas garrisons. 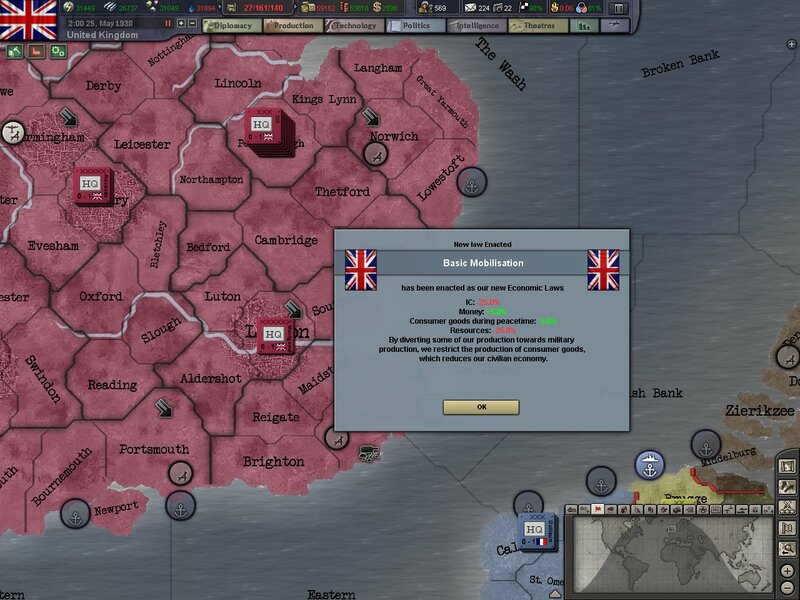 Before this, garrisons in Malta, Singapore, Gibraltar and Hong Kong had been under strengthened garrisons. Now they were replaced by full infantry divisions with heavy equipment and dug in behind fortifications. In response to Germany's full annexation of Austria, Parliament passed the 'Basic Mobilization Act' in May of 1938. This gave us some more IC to work with as well as calling out some of the reserves to bolster our units. The following month we bolster our defenses against the Italians. 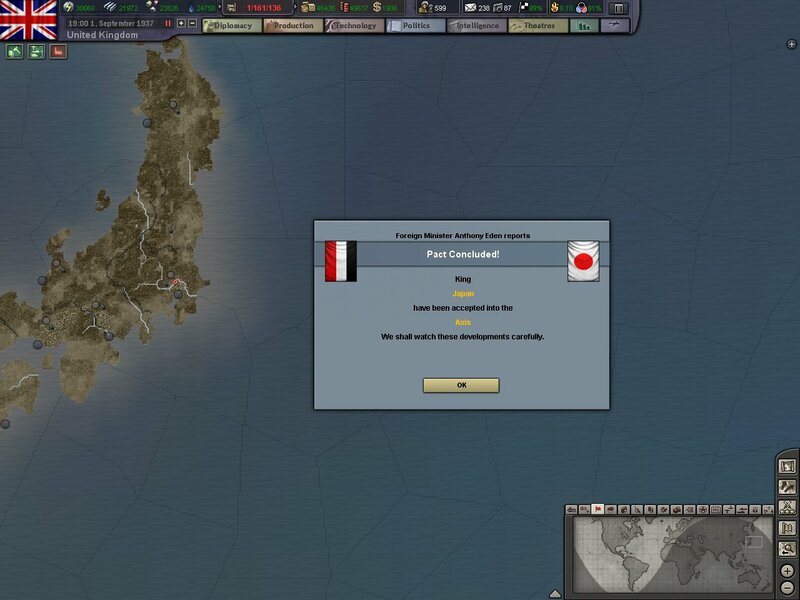 While they hadn't formally joined the Axis with Germany and Japan. They had invaded two countries, gotten quite close with Germany and deployed troops on our border. 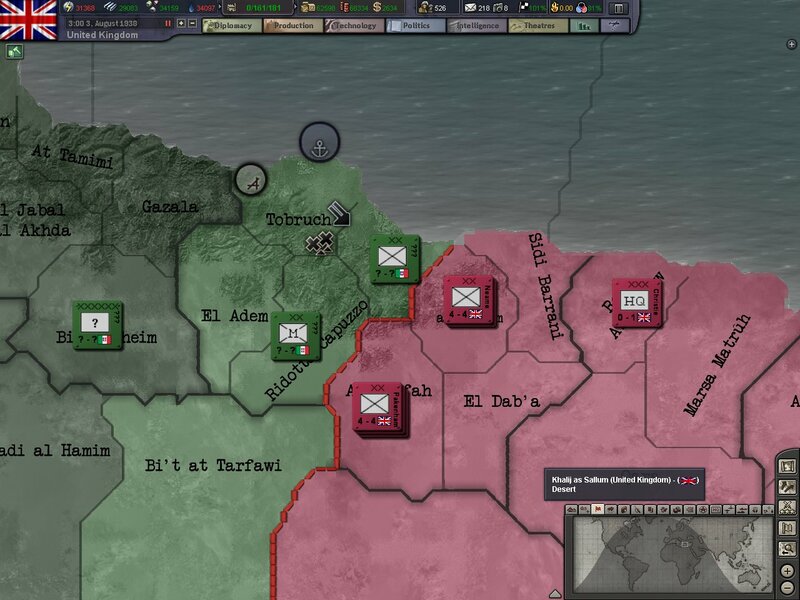 Losing the Suez Canal would effectively cut the Empire in half and thus had to be defended, and in any war would be a priority. In September the world was shocked and put on the edge of it's seat. Tensions rose at a fiery pace and the prospect of war was very clearly on the table. Prime Minister Chamberlain and members of his cabinet met with Adolf Hitler in Munich.And after several days of talks came out of Munich with the 'Munich Agreement'. 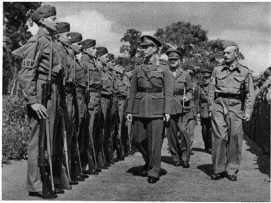 Chamberlain had talked to us in the War Ministry and we had decided that the country nor the military was fully prepared for a war. Yet. And that giving into Hitler wouldn't do to much harm. There were those in the Ministry and Parliament who were very vocal on opposing and not appeasing the Nazi's, but there wasn't much to be done when they started raising their voices. Eight days later we've passed a One Year Draft Act. Giving us more men to draw from as well as slowly getting the country together and ready for a war. 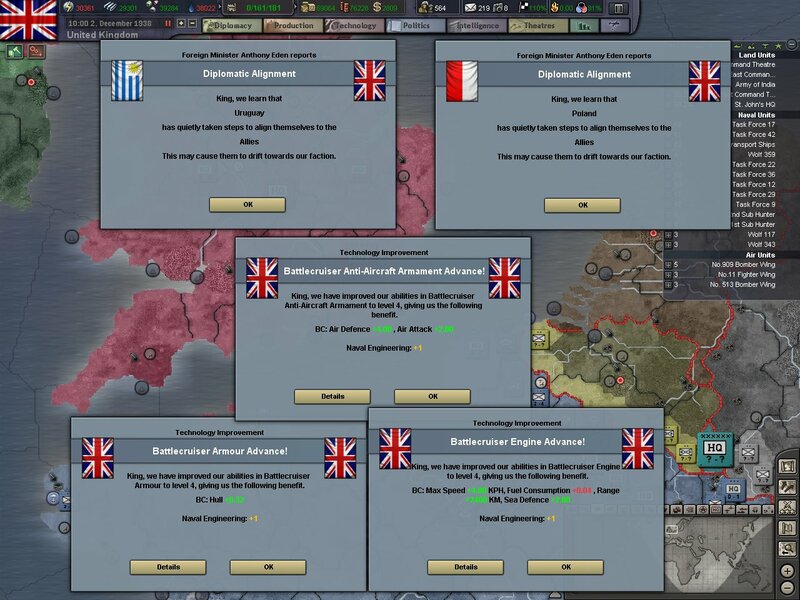 As an early Christmas gift we finished a batch of new battle cruiser technology and received word from the diplomatic sectors that Poland and Uruguay began to shift more towards the Allies, and away from staying neutral. Poland being nested right next to Hitler's Nazi Germany made them particularly nervous on the prospect of war. 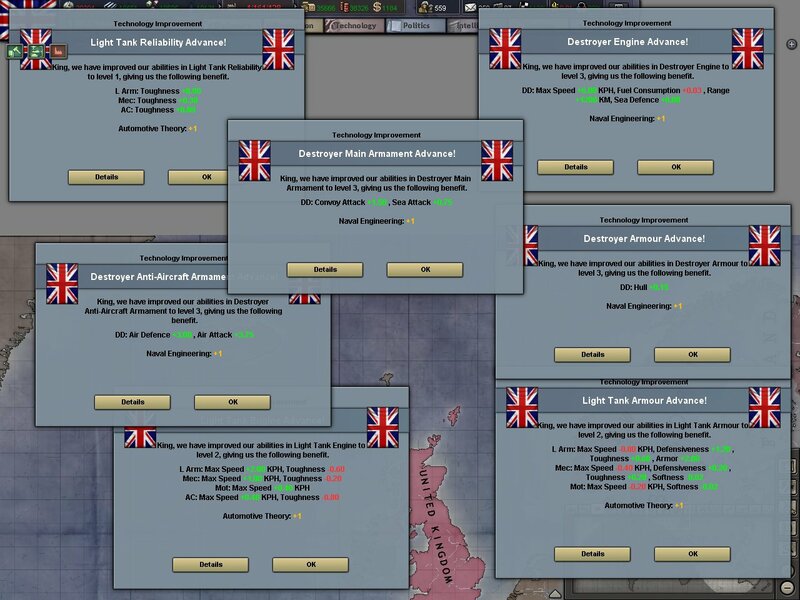 Early in the new year of 1939 Parliament finally accepted my request for a new aircraft carriers. In January HMS Ark Royal and Illustrious were laid down in Liverpool.These new modern carriers would be the mainstay of a new more flexible Royal Navy. 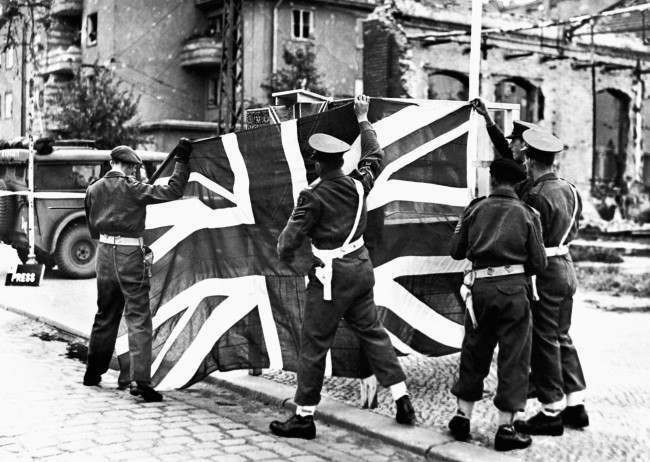 Men of the 49th 'West Riding' Division raise the Union Jack in Hong Kong after taking over the defense of the colony,1938. Well, in 1939 we stand on a knife edge. There are few in the War Ministry or Parliament that believe or trust Adolf Hitler and his promises. There are even fewer who believe a war isn't inevitable. In the Far East the rising sun continues to conquer more and more territory, bringing it closer and closer to our colonial territories. If, and more likely when war does come back, it might be just as bad as the First World War. The Trials of the Sons of Odin: A Paradox AAR. Chapter 1: The Instigator and the Converted.